We finally left Ayvalik last Saturday, clutching last minute presents of books from Gail and Frank, who were berthed nearby. We've made our way up to Thassos, the most northerly place we expect to visit this summer. We had little wind for our first day's sail to Baba Kale, where we anchored in the harbour and stayed on board. Both the wind-vane and autohelm needed attention. 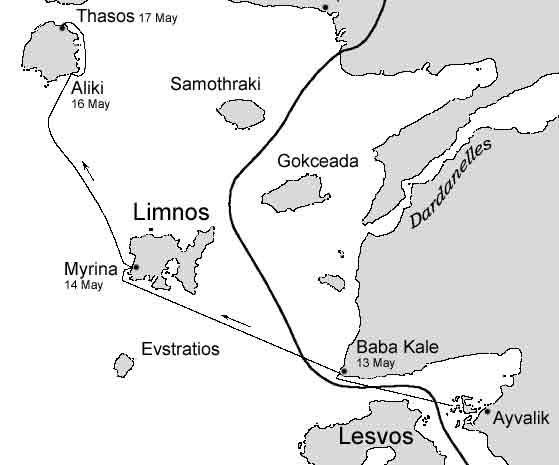 The next day we had a long sail to Limnos in a gentle northerly breeze. We encountered plenty of shipping converging on, or dispersing from the Dardanelles, a few dolphins and swarms of jellyfish but no other yachts. When we arrived at Limnos in the early evening we flew our Q flag, expecting to be greeted by officialdom, but had to go to the local port police office to get attention. They were welcoming and after filling out 3 forms (boat details, crew list and questions about infectious diseases) they stamped our old DEPKA (Greek Maritime Traffic Document) and told us to have a nice day. The cost of entering Greece again was a mere 15 Euros. The next day we explored the castle above the town and surroundings. 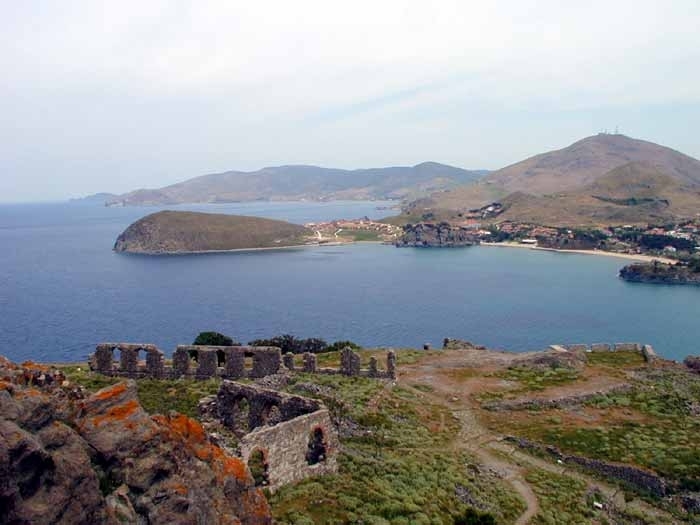 Limnos is not a major tourist island so we were surprised to find English widely spoken. Despite a very relaxed atmosphere there and more to see on the island we decided to head north as soon as possible. 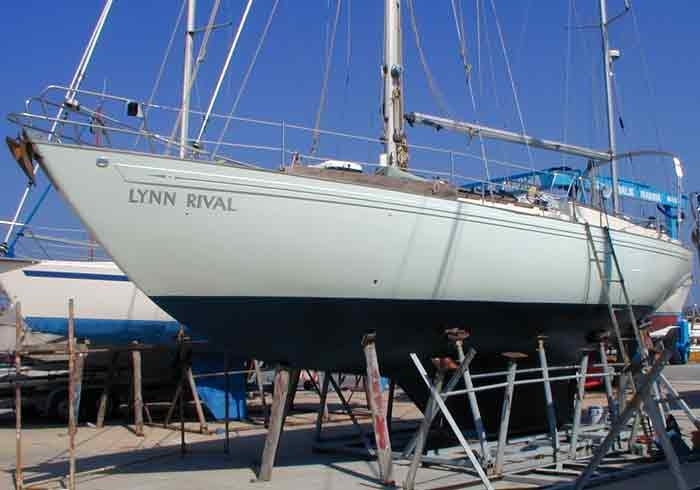 There was another yacht in the harbour, called Playpen, and we exchanged information with Peter and Hilary over drinks on board before preparing for a very early start the following morning. We left Myrina at 2am with a northeasterly wind allowing us to sail most of the way to Thassos. At dawn we could see the majestic peak of Mount Athos to the North west. Other than that all we saw on the journey were a few dolphins and the odd fishing boat. We anchored in a small bay on the south of Thassos island in the early afternoon. A few people were swimming off the beach so Paul decided to go for a swim. By the time I got halfway down the ladder Paul wanted out so I decided not to go any further. Although it is warming up during the day, especially as the winds have been quite light for the last few days, the water is still very cold. 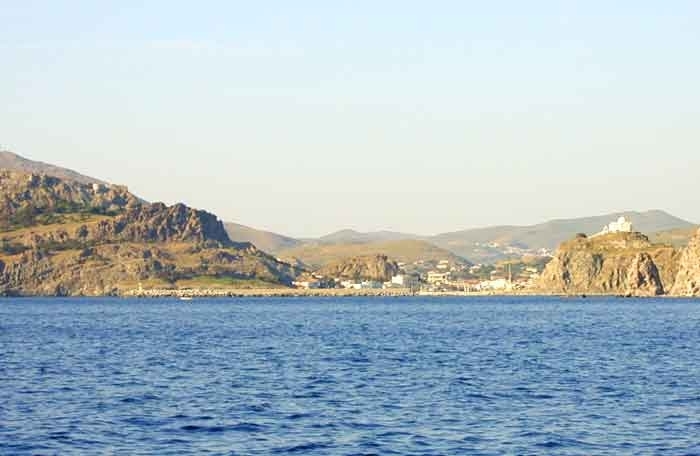 Yesterday we lingered in the lovely bay at Aliki before sailing round the east side of the island to Thassos town. The east side is dramatic from the sea, with layers of granite and marble at different places. We had a good sail in a southerly wind, making our way through the fishing pots that litter the shallow waters here. We tried fishing with no luck. At Thassos we had plenty of choice for mooring alongside in the new harbour, and found a comfortable spot with excellent shelter. In the night we had a thunderstorm so the decks got a good wash down. Thassos town is very touristy but fine out of season. English is spoken everywhere but our efforts to revise our Greek were rewarded with Greek responses. This is not the place for authentic Greek cuisine but the ruins of ancient Thassos dotted around the town and the surrounding hills are well worth a visit. This morning we walked through the pine woods up to the temple ruins and around the ancient city walls. After the thunderstorm the granite on the pathway was glistening and the Spring flowers looking and smelling so fresh. The views were wonderful. After stocking up with provisions we've left Thassos town and are now anchored off a small village on the southwest coast of Thassos. 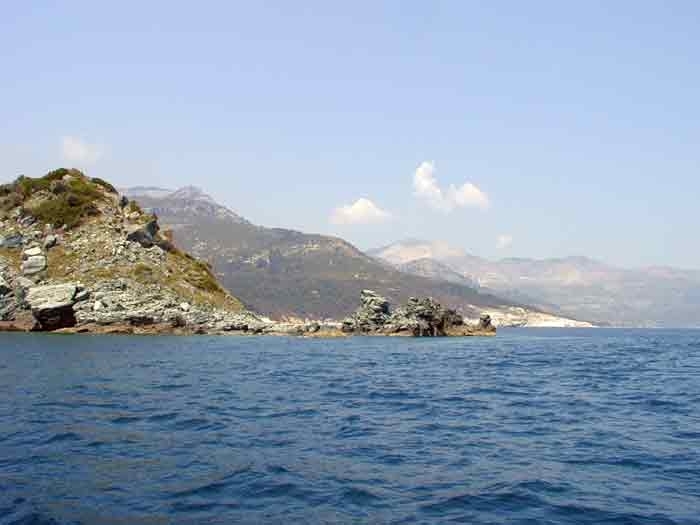 We're planning to set off early tomorrow morning to go south again, to the middle prong of the Khalkhidiki peninsula.